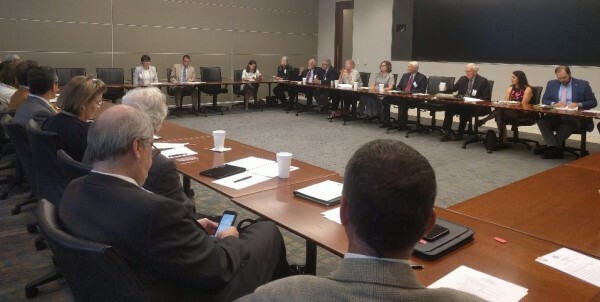 In conjunction with the summer meeting of executive and general board members, VIRGINIAforever facilitated a roundtable discussion with Matt Strickler, Secretary of Natural Resources, and Bettina Ring, Secretary of Agriculture and Forestry. The discussion focused on priorities for the secretariats and how the natural resources community can work together to increase funding for land conservation and water quality improvement in the Commonwealth. Thank you to Secretary Strickler, Secretary Ring and VIRGINIAforever members for a robust and educational discussion. The 2018 General Assembly was one of the longest on record, extending past its scheduled mid-March adjournment to late May. Thus, the State’s new two-year budget – and knowing what natural resources funding would be – was very late being finalized. But good things come to those who wait. This year, VIRGINIAforever saw a number of its budget wishes fulfilled, especially in water quality. VIRGINIAforever successfully lobbied for $20 million to be invested in the Stormwater Local Assistance Fund (SLAF), a State grant program to help localities design and construct new or renovated stormwater facilities. 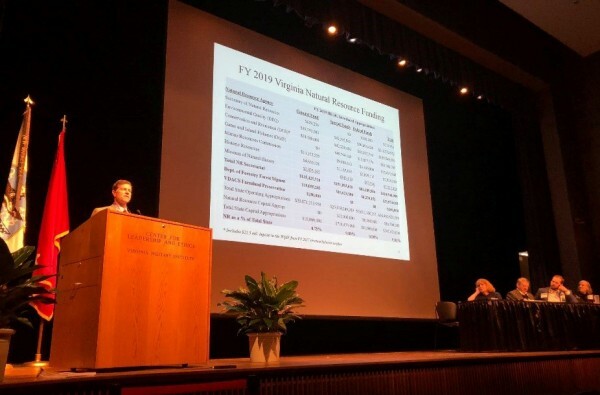 A coalition including the Virginia Municipal League, the Virginia Association of Counties and numerous individual localities was assembled to lobby for new SLAF investments. This $20 million is on top of the $80 million in SLAF funding VIRGINIAforever has helped secure over the past five years. Other water quality funds that were proposed and which VIRGINIAforever supported included $22.5 million for the Water Quality Improvement Fund to support nonpoint source projects, $17 million for Ag BMP cost-share (programs partnering with farmers and others to reduce agricultural runoff to local streams and rivers) and $2.4 million for soil and water conservation districts to provide technical assistance to the ag community. In recent years, the General Assembly has had a tougher time getting behind significant new investments in land conservation programs and initiatives. While the General Assembly did not approve any new funding this year for the Virginia Land Conservation Fund, they did provide $4.5 million to VLCF next year. VLCF works with landowners to preserve forestlands, working farmlands, historical lands, and open spaces. Also this year, the Virginia Outdoors Foundation – the State’s leading land conservation agency – was slated to see a $2 million cut to their operational funds. VIRGINIAforever joined with Virginia’s United Land Trusts and others to protest such a devastating budget cut. In the end, VOF only saw a $250,000 budget cut in each of the next two years. No matter how it’s sliced, the General Assembly is generally more agreeable to additional water quality investments than land conservation investments. And therein lies one of VIRGINIAforever’s lobbying and public education goals in the years to come. In the second quarter of 2018, VIRGINIAforever welcomed Seale & Associates, represented by Pat Coady on the general board. In other board member news, Kyle Shreve is now representing the Virginia Agribusiness Council on the executive board. For information on becoming a member of VIRGINIAforever, please contact Info@virginiaforever.org. Hosted by Virginia Military Institute, Environment Virginia is the state’s premier natural resources meeting, featuring presentations highlighting trends and news impacting the Commonwealth’s land, water and air. This spring, VIRGINIAforever members along with several partners participated in a presentation and panel at Environment Virginia titled “Virginia Natural Resources Funding.” Moderated by VIRGINIAforever lobbyist Missy Neff and led by Jim Regimbal of Fiscal Analytics, the presentation focused on a study commissioned in 2017 by VIRGINIAforever with a grant from the Virginia Environmental Endowment. The study found that Virginia has been spending about one percent of available state revenues on natural resources, ranking near the bottom when compared to other states. Panelists included Pam Faggert of Dominion Energy; Matt Wells of WestRock; Peggy Sanner of the Chesapeake Bay Foundation; and Joseph Maroon of the Virginia Environmental Endowment. Reminder: “Like” VIRGINIAforever on Facebook! VIRGINIAforever is on Facebook at www.facebook.com/ourlandourwater. “Like” our page to stay in touch about VIRGINIAforever announcements as well as natural resources funding news from across the Commonwealth. You are encouraged to “share” and “comment” on our content. Governor Northam Engages Local Communities in Chesapeake Bay Restoration. Earlier this month, Governor Northam kicked off a new phase of Virginia’s efforts to restore the Chesapeake Bay and its tidal tributaries. Working with local communities, elected officials and technical experts, Virginia will prepare a third phase of the Chesapeake Bay Watershed Implementation Plan to ensure that pollution control measures to reduce excess nutrients and soil runoff are in place no later than 2025. Read more here. Governor Northam Issues Proclamation Recognizing Dam Safety Awareness Day in Virginia. Governor Northam issued a proclamation recognizing May 31 as Dam Safety Awareness Day in Virginia. The Governor encouraged Virginians to increase their knowledge about dams and understand the risks associated with improperly constructed or maintained dams. The day coincides with National Dam Safety Awareness Day, which commemorates the nation’s worst dam-related disaster—the May 31, 1889, failure of the South Fork Dam in Johnstown, Pennsylvania. Read more here. Governor Northam Announces New, Innovative Land Conservation Strategy. In April, Governor Northam announced a new land conservation strategy that will focus resources on preserving lands with the highest conservation value for the Commonwealth. Working with state agencies and partners, the administration will first prioritize permanent protection of the top two percent of lands with the highest conservation value, with the goal of achieving protection of the entire top ten percent within the next ten years. Learn more here. First Lady Pamela Northam Celebrates Earth Day 2018. In celebration of Earth Day 2018, First Lady Pamela Northam planted flowers around a LOVE artwork display at the Executive Mansion. The LOVEwork planter was onsite when the Executive Mansion joined Virginia’s Historic Garden Week for 2018 Garden Day in late April. Read more here.